Lock in a great price for Melbeach Hotel & Spa - Adults Only – rated 9.4 by recent guests! Staff was amazing, breakfast was delicious, location was beautiful right on the ocean front. We loved it all! Nice rooms. Very comfortable bed and nice bathroom with rain shower. Great to sleep with the sound of the ocean and sea view from the bed. Breakfast was really good. Fresh orange juice! Food at the restaurant was also good. We had a rainy morning so booked a massage. The masseusse was excellent. Relaxing location. Great location to explore the north east coast of Mallorca. Breakfast was high quality and broad choice. Room location was outstanding with direct view onto ocean. Parking easy albeit it's a quiet time of year. A relatively quiet area. 20 minutes walk along coast to Arta Caves, a real bonus of this location - and they are stunning. A must do. Great beach, excellent restaurant and service. Good breakfast. Fabulous adults-only property located right on the beach in Canyamel. Everything in the hotel is to a high quality specification. Extremely comfortable. Excellent breakfast buffet - again very high quality of produce and good range. Really enjoyed the calm child-free ambiance. Front staffs were helpful and kind.Room cleaning service was very good Equipment and room was so modern and clean.Very quiet and beautiful beach in 1 minutes from hotel.Restaurants was very good! All our stay in this hotel was fantastic! Location, beach, food, room with the view, bed, staff - exceeded my expectations. Looking forward to go back there next year! Melbeach Hotel & Spa - Adults Only This rating is a reflection of how the property compares to the industry standard when it comes to price, facilities and services available. It's based on a self-evaluation by the property. Use this rating to help choose your stay! One of our top picks in Canyamel – and a guest favorite. Featuring a terrace and outdoor pool with sea views, Melbeach Hotel & Spa offers elegant modern accommodations in Canyamel. Just a few steps from the beach, the property also has a spa and wellness center. With free Wi-Fi and a terrace with sea views, the air-conditioned rooms include a mini-bar and a flat-screen TV. The private bathroom has a shower, hairdryer and free toiletries. A rich breakfast is served daily. There is also a bar and a restaurant serving Mediterranean cuisine prepared with local ingredients. 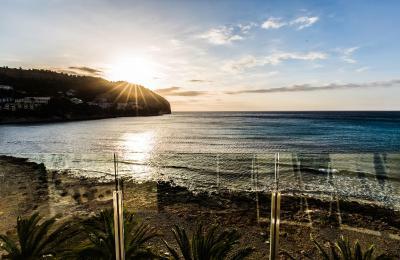 Melbeach Hotel & Spa is 9.3 mi from Cala Millor. Palma de Mallorca is a 1-hour drive away. When would you like to stay at Melbeach Hotel & Spa - Adults Only? Featuring a terrace with sea views, this air-conditioned room includes free Wi-Fi, a flat-screen TV and a mini-bar. Featuring a terrace with sea views, this large air-conditioned room includes free Wi-Fi, a flat-screen TV and a mini-bar. Featuring a terrace with sea views, this air-conditioned suite includes a sofa, free Wi-Fi, a flat-screen TV and a mini-bar. This double room features a bathrobe, tile/marble floor and mini-bar. House Rules Melbeach Hotel & Spa - Adults Only takes special requests – add in the next step! Melbeach Hotel &amp; Spa - Adults Only accepts these cards and reserves the right to temporarily hold an amount prior to arrival. Melbeach Hotel & Spa - Adults Only accepts these cards and reserves the right to temporarily hold an amount prior to arrival. Please inform Melbeach Hotel & Spa - Adults Only of your expected arrival time in advance. You can use the Special Requests box when booking, or contact the property directly using the contact details in your confirmation. No tea/coffee facilities in room. Very alternative choices to eat, especially as many had not opened for the season (we were there early April 2019) but I did know that in advance. Restaurant at hotel was very good but limited menu and a little too specialised for our tastes. lack of alternative restaurant offers around the village , there were only few restaurants , at the nice ones you wouldnt get any tables without reservation. Water dispenser would have been good in the spa - and a room to shower and change in when having a late check out. Note that because the hotel is on the beach and unfenced, other beachgoers including families can sit directly in front of the hotel. Effectively it is a public space. The hotel’s pool is small and unheated. 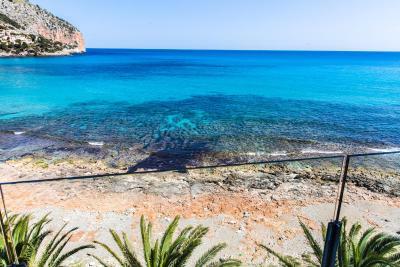 Canyamel is a great beach but be aware that it is a traditional family-orientated resort with quite basic facilities and a lack of decent restaurants and bars. This hotel is very sophisticated but the resort is not. At least 80% of visitors to this resort are German so it does not have a Spanish feel. Couldnt be closer to the sea unless it was in the water. Comfortable lounges and outside sofas. Spotlessly clean. Chef is very talented and prices fair. Loved the clean, contemporary decor with natural finishes. The smell of sewage in reception on several occasions. The boutique aspect of our stay was wonderful. Quiet and the most incredible location. Will definitely return to this paradise in Mallorca.